"A spoof blovel about online shushpiles, writing communities and publishing"
Born out of experience of writing communities online, the ins and outs of the publishing world, online slushpiles (naming no names, it is a spoof, after all, any resemblance is purely coincidental . . . )Murder At Anonomy is about an author determined to take on the system and make it work for him – with or without internet knowledge. The path is somewhat perilous, particularly as he chooses to be ruthless. His success and dubious methods begin to irk fellow authors who decide to track him down . . . Murder on Anonomy, a Blovella has not been tagged yet. 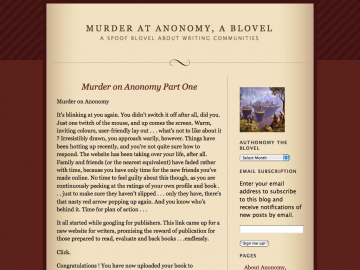 Help others find Murder on Anonomy, a Blovella by tagging it! Murder on Anonomy, a Blovella has not been recommended yet.